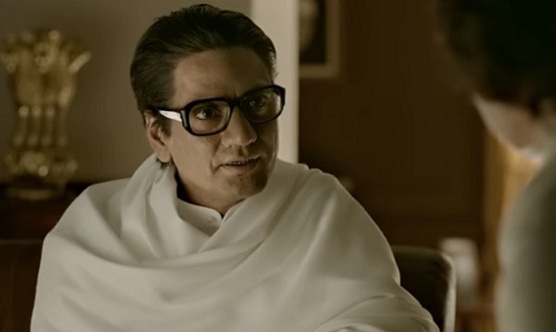 When the incendiary trailer for Abhijit Panse’s Thackeray landed, the actor Siddharth tweeted: “Nawazuddin has repeated ‘Uthao lungi bajao pungi’ (lift the lungi and *’#$ him) in the film #Thackeray. Clearly hate speech against South Indians… In a film glorifying the person who said it! Are you planning to make money out of this propaganda? Stop selling hate! Scary stuff!” With due respect to Siddharth, that is perhaps the point. Thackeray is a warts-and-none propaganda film about a man who peddled hate and keenly fostered a sense of otherness (first South Indians, then Muslims). The trailer may be offensive, but it’s honest. The story is, after all, by Sanjay Raut, a Shiv Sena member and a Rajya Sabha MP. And this is, after all, an election year. Are you covering Manikarnika for FC? Thackeray didn’t really care for religion – he was a proud self-proclaimed atheist. He was a shrewd who played the Hindutva card when it suited him. For all his anti-muslim rhetoric, people forget that a Muslim was his long-time partner. He was savvy, intelligent, ruthless and had a great sense of humour. One only wishes that he had used that intelligence for the greater good. Loved the ‘pee-ceful protest’ reference. 🙂 That was sheer brilliance. Been reading you since a long long time, never commented or tried to reach out. But this review is one of my favourite from you. Really impressed how you judged the film for what it was trying to achieve and didn’t straight away gave it a 1 star for being propaganda. Please do more Hindi film reviews! Last line was deadly! As for the movie, I suppose one can’t expect anything but a whitewash from Raut. The man himself and the party are rather more complicated with contradictory impulses (BJP’s Hindutva on the other hand is more straightforward). Thackeray and the Sena have a curious attachment to Bombay as it is meant to be and its cosmopolitan character which goes counter to their Marathi asmita plank. It took the arrival of BJP in a big way in Maha politics for this side of the Sena to come out. One, when LED lights were installed on the Marine Drive at the Power Minister’s behest, the Sena was upset that the beauty of Mumbai’s most iconic road had been marred. A sentiment that long time Mumbaiites shared of course. LED lights were here to stay, protestations notwithstanding, but orange colour lights now replaced the dull white lights originally installed. Two, when BJP tried to impose parayushan on the entire city and force slaughter houses shut during the period of parayushan to appease its Jain votebank, the Sena stood up to it and organised protests, its workers selling chicken on the street similar to the way vegetables are sold by hawkers. Now how do you reconcile this with the party that ransacked Vijaypath Singhania’s hospital in Thane just because their leader Anand Dighe who had been admitted after a heart attack died there? You cannot. So no they are not angels at all and I have disliked them for a long time but they are also complicated and can take unexpected positions. The Thackeray scion Aditya has been campaigning to allow shops to remain open 24/7 in at least some designated entertainment zones. Again an idea that has been suggested by experts before. Balasaheb also proudly brought ‘home’ Michael Jackson in his international prime back in the 90s. In their hearts, they loved Bombay but in their head they thought/knew it wasn’t good politics. We live in an era where gomutra is not just being sold in packaged bottles as an energy drink, but also being promoted as a vaccine for cancer and other deadly diseases. Perhaps, the man was testing his own medicine? A few years ago, Shiv Sena hooligans prevented Nawazuddin Siddiqui from playing a part in a Ramleela programme. They said, “For over 50 years, no Muslim has been a part of the production. Why should this be allowed now?” And now, that same Muslim is playing their Supremo. Wish I could quote that once-famous-now-trite Goundamani line from Suriyan. Govindam: Serious question. Why do you guys hate Mani Ratnam so much? BR: I neither hate MR nor his works. I have no objection with you liking MR’s works. But, like that saying, you always end up somehow referencing MR and his work. Is it because you consider his works as a Golden Standard of sorts, or is it the subconscious impact his work has made on you while penning Conversations with MR? Is there no one such director other than MR whose film making can be a good reference for pointing out anything in a new film? You analyse a film more on the lines of Roger Ebert, don’t you? His style of looking at a film reflects in you too. Now, as a reviewer, if Ebert can be a possible inspiration, is MR a possible Golden Standard? an auteur who has impacted your film viewing experience? Govindam: It’s a given that I like MR’s sensibility. I don’t deny that at all. My question is this. Why don’t you ACTUALLY read my reviews and point out the last time I referenced a Mani Ratnam movie. That way, your statement makes sense. Otherwise, it’s just a “look ma, I’m so clever” jibe. It’s not just you. Even when I reviewed Kaala, someone posted that I compare every film to Kamal or Mani’s films — they conveniently omitted the fact that I had referenced, say, Subramaniyapuram in the Madras review (along with Sathya). I reference SO MANY filmmakers repeatedly. Bhansali, for one, in the Simmba review. Yet, only the Mani Ratnam references get singled out. Which is why I wonder if you have a problem with the director himself, rather than my referencing of him. BR, I “might” be the only guy saying this among many readers you have interacted with. But honestly, many references seem references alone. Like say, “Is it a nod to this filmmaker’s work?” or “We’ve seen the likes of these dealt by some other filmmaker in the past in his own style”. When it comes to MR, the reference seems like an accomplishment of MR which the new filmmaker could not achieve or outdo, at least uninterested in looking at. I wonder, how someone who hasn’t dealt with way too many genres as a storyteller has managed to show his “omnipresence” in cinema. Not your fault. There are people who feel C V Sridhar made brilliant films than anyone else in the yore, despite equally talented filmmakers who’ve made some great cinema. All I am curious to know is about what you find so likeable in MR’s craft? That specific quality in MR that kept you invested in him till date. What made him special to you than anyone else in the business? We too wish to have some conversations with you. It would be interesting to understand what in his work appeals to you. And on an ending note, if you are hurt by my questions, forgive me. I wasn’t taking a clever jibe or so. That saying (still none has given me that saying in Tamil) resonated here and hence I asked it. If anyone knows that original, drop a comment. Thank you. Govindam: There’s no hurt, here. I am just trying to understand why people single out my Mani Ratnam references when there are many other filmmakers being constantly referenced as well. But I am not dragging in Mani Ratnam randomly, right? On the surface, Thackeray IS such a Nayakan like story — that of a Saviour of a linguistically bonded community, someone who did things other might think of as “bad” in order to help his people. Can you think of any other Indian movie, prior, that became the “template” for such a theme? It is a problem only when you keep bringing in a name for no reason. And it is very much a critic’s duty to compare/contrast earlier films of the type with the current one. At least, that’s how I think. And when one brings in a comparison, sometimes it’s a favourable one, and sometimes it’s not. In Simmba, I made a reference to the Kader Khan school of writing. There’s a point of note for Kader Khan biographers, too. One of the songs between Simmba and Shagun is a recreation of Nusrat Fateh Ali Khan hit, Tere bin nahin lagda. A Punjabi-laced track between two Marathi speakers? This is when you recall how precise Kader Khan was in making characters speak in their own lingo. See, just because you point it out I am not going to stop bringing in Mani Ratnam into my reviews (if the context demands it). I’m only trying to debate this point that keeps coming up. “But I liked Saawariya too when no one else did ” – And also Jhoom Barabar Jhoom. And also Alavandhan? That’s one possibility, BR. People might complain about what they intend as, uh, Conflict of Interest? I get your point about Kader Khan. I agree that no film like Nayagan existed before (at least for me, it was the first of the Godfather influenced films). Let’s imagine a comedy film where a stranger from South India has gone to Mumbai to become something and ended up as a petty criminal. Just because this has happened, can we compare that film with RGV’s Satya? I ask this because, there are people here who compared Anwar’s birth in Petta with Thalapathy because (a) it was a male child in the train and (b) the lighting was super intensely golden. So, if interested, can you explain me what separates these “spot the semblance” things from the ones like Nayagan and Thackeray comparison? How do we react to them while reviewing? And will that change if it is a case of “meta” cinema? @Govindam: I am not sure why this is conflict of interest: unless you suggest that BR’s book will make money if he keeps referencing MR in his reviews. I think that’s a bit far-fetched: if BR would say: “MR says X. Now read my book for more.” – then, that would be a whole different beast. I also think some amount of confirmation bias comes into play when people criticize BR for making too many references to MR. BR wrote a book on MR. So, critics of BR overweight evidence that shows BR referencing MR and underweight references of (a) BR talking about others (b) BR missing a convenient (and obvious) MR reference. (a) is particularly true for a lot of us and BR has also referred to it in the comments above. But, think of (b) – there are many places where BR could have brought in an MR reference and didn’t. I have been reading BR for years now and, to be honest, do not think he disproportionately references MR in the recent past. And, even if I am wrong empirically (someone could run a text analysis – a word-cloud – of all of BR’s reviews and we can figure this out quickly), I do not think all his MR references are favourable to MR. Finally, what is wrong if BR references MR? MR has a body of work that is pretty significant and wide-ranging, especially as a Tamil filmmaker in the last three decades. BR can claim some expertise over that body of work. So, BR referencing MR would only add to the review – it is an expert talking about what he knows best. If MR made one movie and BR kept referencing that, then I can see the issue. In the end, as BR says, a review is about a critic communicating HIS experience of the movie to the reader: if an MR reference can convey that better, then I don’t see why it should irritate anyone. “there are people here who compared Anwar’s birth in Petta with Thalapathy because (a) it was a male child in the train and (b) the lighting was super intensely golden.” – I did too and not for those reasons but because mother and child are shown to escape to Aus on a boat. And I was assuredly NOT thinking of Mani Ratnam there but simply because Thalapathy also starred Rajni and thought KS was referencing it. It was a spontaneous observation whilst watching the film and NOT an “Oh, look see, Mani did this in Thalapathy but so much better” kind of thing. I also compared the Vethalam flashback to Moonram Pirai (many did at the time too). Maybe some of you dislike Mani and therefore find references to his films in reviews irritating? “Let’s imagine a comedy film where a stranger from South India has gone to Mumbai to become something and ended up as a petty criminal. Just because this has happened, can we compare that film with RGV’s Satya? ” – You can compare anything, it depends on the perspective, right? A movie is a creative endeavour and somebody who writes about the movie also relates laterally and not just in a linear, math manner to it. OK, I used to write about cricket and while describing India’s abject surrender in England in 2011 and Dhoni’s struggles to find pace bowlers (RP Singh was rushed in from a holiday and found to be grotesquely unfit), I evoked a scene from the Queen Elizabeth film where, after a battle is lost, she surveys the wounded/dead soldiers and finds to her dismay that some hapless kids had been drafted into the army to fight. Now this may seem like a very outlandish comparison but it struck me while writing about the defeat and I went with it. I may add that if all non technical writing was based purely on logic, it would get very boring very fast. Everyone worth their salt is trying to put me in my place. I like it, this sense of unity in you guys. This comment section seems like an ethnic group of its own. Now, you all say that I was wrongly accusing (allegedly) BR of being favourable to MR. Okay, I humbly apologise. Happy? Egos massaged? And let me say this too, that I alone aren’t the person who has criticised BR for this. More came, more have come and shall arrive. This shall continue unendingly, BR. Maybe even after your graceful exit from the mortal world. Now, one last favour. Can anybody having a good knowledge of Tamil sayings, please help me know that Tamil saying related to Ranganathar’s feet? It loosely translates to “Whether you go in the right route or the other way around, you shall end up at Lord Ranganatha’s feet”. Please let me know on the comments section here. Govindam: Why this persecution complex? We are having a back-and-forth, as far as I can see. So you are allowed to say something to validate your POV and I am not allowed to put forth my POV? Where does ego come into this? Look at the comments thread of my Chekka Chivantha Vaanam review. There, some people were saying I was too harsh on the film, and defending the film against my take. It happens both ways, boss. No one is saying you shouldn’t criticise me. All I’m asking is… where’s the proof that I am unduly bringing up MR in “almost any new release in Tamil or Non Tamil”? Hi BR. Genuine doubt, according to you, is it so important for critics to be unbiased. And also, if it is important, do you have any checks and balances built in to your system to avoid subconscious bias affecting your work? bala: I have said this many times earlier. There is no such thing as unbiased criticism. The important is whether the bias is conscious or unconscious. The latter is a problem. The former is inevitable — it has to do with one’s taste. ” And let me say this too, that I alone aren’t the person who has criticised BR for this. ” – So finally you admit you criticised him. Actually this is what I wanted to hear. Having made a pithy quote about arriving at Ranganathar’s feet, you tried to later paint it as if you had a genuine query about his process. It is good that at least you are keeping it honest now. Actually, I do think he is biased in Mani’s favour and he has not denied this as you see above and as he has explained before (that he simply finds Mani’s films interesting even when they are not ‘good’). That is not the point here. I have not noticed him making references to Mani’s films everywhere. So when you claim something like that, you better be able to back it up. Otherwise it’s just an impression based on nothing in particular and be prepared to concede your impression may be as biased as the critic’s views on Mani. Thanks for explaining. I won’t suggest that you would lie to your readers that you liked or disliked a movie. That’s out of the question. I was asking about unconscious bias only. ie, increased probability of you liking or disliking a movie because you know it was made by someone, or someone acted in it. Let me put it this way: while watching a maniratnam movie(for example), do you take steps to forget that you are watching a maniratnam movie? bala: I don’t know how to answer that question. I do not have that kind of insight into my psyche. All I can say is I knew CCV, Roja, Bombay, Thiruda Thiruda, etc. are Mani Ratnam movies and yet they did not work for me for various reasons. In the sense… I only am conscious/aware of what what I feel during/after the movie. இங்க தமிழ் தெரிஞ்சவங்க யாருமே இல்லையா? Rahini: எனக்கு தமிழ் தெரியும், ஆனால் இங்கே அதில் பேசினால் BR ‘ஐ தவிர யாருக்கும் புரியாதென்று பேசுவது இல்லை. @Rahini: “இங்க தமிழ் தெரிஞ்சவங்க யாருமே இல்லையா?” – Theriyum ana andha Ranganathar sollu yennakku theriyathu. Sorry, don’t have Tamil script on the laptop illata thadukki vizhundhu thappu thappa Tamil type pannirupen. @bala, sorry to jump in. I wonder if it is even possible to forget an information like that and watch a movie. May be it’s possible in some kind of a meditative state but even then there is no way to say if the unconscious bias is adding its inputs. On the other hand, it is quite possible to check bias when one is writing. Every line one writes one can ask themselves what makes them write this. What bias is influencing them. And then one can chose whether to write it or not. If one is writing a report then this is the way to go. The problem with the above approach is it will interrupt the flow of writing. The writing becomes restrained. It does not reflect the person who writes it. If one sees writing as an art then one can’t/shouldn’t do this. BR is a critic but is also a writer on his own right. At least in one article recently, the article about Kamal I think, I felt BR the writer overshadowing BR the critic. Sometimes I wonder if his followers are a fan of BR the writer or the critic. And I have also wonder if BR prefers to be one over the other. On the note, I would think it is only fair for BR to not filter out any conscious or unconscious bias while he is writing. @BR, Today I watched Bombay and Kaatru Veliyidai (both first time) and have to say Bombay hasn’t aged very well, while I was engaged through out most of the latter(the only portions that were boring were the Pakistan scenes especially near the end). Now I truly dont get how KV is hated so much, I mean obviously it has flaws but its more exciting cinema than the overtly didactic Bombay. So I guess I am the 6th person in the world who liked KV. Not just South Indians and Muslims – there were hate campaigns and assaults against Gujaratis and UPites/Biharis as well in between – till these two groups turned out to be possible vote banks. @easwar, what I asked is impossible, and I was foolish to ask that. Thanks for understanding what I meant. But I too agree that BR doesn’t have to have checks against unconscious bias. But looking at the way he has been responding to accusations, I thought he might be aiming at being as unbiased as possible. That’s why I initially asked if being unbiased was important to him. Looks like he is only worried about accusations of conscious bias. Which is understandable. @bala In theory, your proposition is interesting. But the artist brings his/her own style and personality to bear on his/her creations so it’s impossible to forget their identity. Like a Raja or Rahman have their signature melodies. Hearing those signature melodies itself affects one’s reaction to it, the knowing that it is a trademark composition of XYZ. Another thing is knowing who the artist is defines our expectations of the movie /soundtrack etc. Would an Idhaya Kovil still be panned if it was directed by Sundarrajan instead of Mani? Probably not. Likewise when people say Raja /Rahman’s new creations are not good, they are comparing them to the past works of both. They are not necessarily THAT bad compared to what messrs Anirudh & Co are doing (OK Sarkar was). My point is knowing the artist is one of your favourites doesn’t just bias you always in a positive way but also a negative way at times as you hold them to a higher standard than those from whom you have no expectations.